This page was placed last in the list on purpose. Don't worry, the information about adjusting your carb is on this page (way down at the bottom). FIRST, I wanted to make sure you understand that the Carb is almost always the least likely source of trouble. One of the first hard lessons I learned is that almost EVERYBODY starts start out fiddling with the carb when they are looking for a problem. But 99 percent of the time, the problem is somewhere else. All we are usually doing is CREATING more problems by fiddling with the carb. Think about it a second. What are the chances that the carb has all of a sudden become misadjusted? All those little spring-loaded adjusting screws just started re-adjusting themselves, right? We often use those adjustments to make our engine run better because it is easier to turn an adjusting screw than anything else. These adjustments can compensate for and mask other problems. But, when we are eventually forced to find and fix the real problem, we will now have to readjust the carb. This is at least twice as much work as staying on top of the regular maintenance. Always start by looking for and fixing the most likely problems like fuel supply, clogged filters, corroded connections, burnt points, fouled plugs, etc. After cranking the engine, carefully check for excessive temperature at the connections of your battery cables. Your cables may be too small and your connections may be less than perfect. Remember, 6 volt systems draw more amperage. All wiring and connections should be as close to perfect as you can get 'em. Is the battery dead? Check it with a voltmeter. Now, a reading of 3 volts for a 6 volt battery is NOT 50% charged! Batteries don't work that way. A 50% charge on a 6 volt battery is 6 volts, and fully-charged is about 6.3 volts. At anything less than 5.5 volts your battery is considered dead-flat and may be too far gone to even accept a charge! For a 12 volt system, 100% is 12.6 volts, 50% is 12.0 volts and dead flat is 10.5 volts! Engine turns over but won't start, you smell gas. Did you forget to turn the ignition on? The start pushbutton simply grounds the terminal from the solenoid, so these engines will crank with the ignition turned off. I have occasionally put the key in, turned on the gas, climbed on, put it in neutral, stepped on the clutch, grabbed the choke, hit the start button, and proceeded to flood the engine. For some reason actually TURNING the ignition key ON is not in that sequence. I don't know why, but it has happened enough times that I put it here. If nothing else, you can have a good laugh at my expense. Won't Start, getting gas & spark - You have spark and gas is getting to the carb, but the tractor won't start. If the tractor has been sitting for some time, it is likely that your gas has gone bad or has water in it. Drain and replace the gas with new. There is a drain plug on the bottom of the carb that will let you drain the entire system and fuel tank into a can. Stick a fresh set of Autolite 437 plugs in it also. If you keep your fuel tank more than half full you should have less problems with bad gas. Won't Start, water in distributor cap - If you have trouble with your tractor during high-moisture times like, after a good rain, snow, or after power-washing it, check inside the distributor cap for moisture. Dry it all out inside (maybe put a fresh set of points in it) and you should be on your way again. This seems to happen more with the front-distributor engines. Replacing the gaskets on the coil and distributor cap should make the distributor assembly more waterproof. Won't start, weak or no spark - run a jumper across the ignition switch terminals and try it. If it starts, replace your ignition switch. Don't leave the ignition switch jumpered for long periods with engine off or you could fry the points and the coil. If it wasn't the ignition switch, check for voltage at the small wire on the coil. On a side mount, look very closely at the wire coming from the coil to the distributor. This wire often gets damaged where it passes through the distributor housing. This will cause an intermittent failure that can be very hard to find because almost anything you touch could seem to make it run better for a moment or two. On a front mount, this same problem is often caused by grounded points where the capacitor connects or the coil spring connector on the bottom of the coil is not making good contact with the points (just stretch the springy thingy a little). The front-mount square-can coil is also not a very durable part and some of the replacements seem to fail right out of the box. So, even if you just replaced the coil, you might want to try a different one. Won't Start, Flooded - Most of these engines require very little choke and are VERY easy to flood. My 8N is very forgiving. Even if I have flooded it, all I have to do is shove the choke lever back in and it starts with a big cloud of black smoke, cough, choke, gasp. Some engines just won't start until you put in a fresh set of plugs. Use Autolite 437 plugs. They run a little hotter and stay cleaner. If your tractor starts, but you still have problems, here are the most common symptoms and solutions. Runs for about 1-minute and quits; restarts in about 5-minutes = BAD CONDENSER, replace it. Runs for about 15-minutes and quits; restarts after about 30-minutes cooldown = BAD IGNITION SWITCH, jumper across switch to test, and if problem goes away, replace ignition switch. Runs for about 30-minutes and quits or starts running rough; after 1-hour cool down restarts and runs fine = BAD IGNITION COIL, replace it. Tractor is flooded, gas leaking out of carb. Float valve in carb may be stuck (whack side of carb with a wooden hammer or screwdriver handle). Leaking or cracked manifold, Broken wires from distributor to engine, Incorrect firing order (should be 1243 front to back), Grounded or loose points. OK, FINALLY! Here is the carb adjustment procedure you came here to get! These adjustments and proceedures are based on the original type Marvel / Schebler Carb. Many of these tractors have replacement Zenith Carbs. Some people claim the Zenith is an upgrade. I'm not sure. Anything may seem like an upgrade when you are replacing a dirty, worn-out carb with a new one. The M/S and Zenith carb adjustment procedures are similar. One very important internal adjustment you should check is the float setting. The M/S float should set at 1/4" off the flat surface with the top of the carb held upside down and the valve assembly in place. CAREFUL! if this adjustment seems way off STOP and make sure the seat for the float valve is screwed all the way in and the float pivot is in the right place. Many people don't have a tool that will span both slots in the float valve seat. They often fail to get this part screwed all the way in. Many rebuilt carbs have failed and been sold because of this. Make a special screwdriver tool that will span both slots to fully tighten the seat and gasket. I have used something as simple as a dime in a pair of locking pliers. EXTERNAL ADJUSTMENTS - There is no magic here, just about anybody can do it. There are only three external adjustments on the 9N/2N/8N tractor carbs. The image provided below is looking at the front end of the carb, the engine would be on the right side of the image if shown. 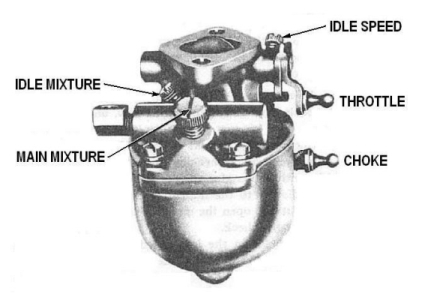 1 IDLE SPEED SCREW—Located on the throttle lever. 2 IDLE MIXTURE SCREW—Small screw near connection to manfold pointing to the side. 3 MAIN MIXTURE SCREW—Large screw located at the top-front end of the carb. White Arrow = IDLE MIXTURE. Yellow Arrow = MAIN MIXTURE. For the Zenith replacement carb, adjusting screws are in similar locations. 1—Turn the IDLE SPEED screw all the way out and then turn it in slowly until it just makes contact with the pin and the throttle plate is fully closed. Then turn the IDLE SPEED screw in three full turns. Sometimes there is an alignment problem and the IDLE SPEED screw does not line up with the pin. If that is a problem, CAREFULLY bend the tab on the throttle lever to get better alignment. Don't try to bend the pin, it will snap off! 2—Turn the IDLE MIXTURE screw all the way in and then back out ONE turn from the bottom. 3—Turn the MAIN MIXTURE screw all the way in and then back out ONE full turn from the bottom. After bolting the carb to the engine and following the tuning instructions in the next few paragraphs, my fine-tuned M/S carb adjustments usually end up very close to the IDLE SPEED screw two turns further OUT (slower) from the initial bench setting, the final IDLE MIXTURE adjustment about 1/4 to 3/8 turn IN (rich) from the initial bench setting, and the final MAIN MIXTURE adjustment about 1/4 turn OUT (rich) from the initial setting. This is not a typo, the two adjustments are opposite, IDLE MIXTURE is IN for RICH. These settings should be darn close for most engines that are in good condition. If any setting is much off from these, I start looking for the problem. The carb is a pressure-balanced system so things like a bad gasket, cracked, or warped carb casting will prevent it from working properly. Usually the problem is dirt not cleaned out of a passage. Ok, 90% just stopped reading at the last paragraph and are now out riding around, perfectly happy, with a carb that is almost tuned. I'm Guilty, somethime close enough is good enough for me. Especially when the snow is falling and I gotta get to work. For the other 10% who want to get it dead-on right, read on. 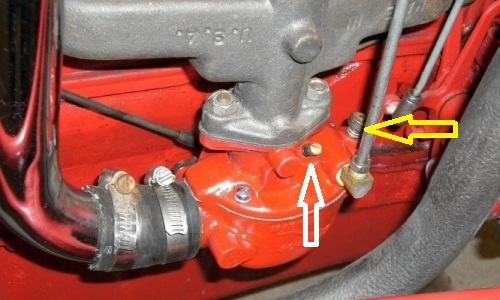 The Marvel Schebler carb is very simple to adjust, but it can seem to be a very contrary beast. This might be because the IDLE MIXTURE adjustment operates backwards from what you might think. Turning the screw OUT makes the mixture more lean and IN makes the mixture more rich. The IDLE MIXTURE on any other carb you may have messed with in your youth was probably the other way around. I believe many carb adjustment problems on these tractors are caused by the IDLE SPEED being set too fast. Many people are used to automobile engines that typically idle around 800 RPM. At 800 RPM the IDLE MIXTURE screw on the Ford 8N Tractor is almost useless. You can turn it all the way in or all the way out with very little noticable effect on the engine. The IDLE MIXTURE screw is useless until you get the IDLE SPEED backed down to a slow idle of around 450-500 RPM. My initial bench setting should idle at around 800-RPM. I do this on-purpose so I know the engine will start and run on just the MAIN MIXTURE adjustment when I first crank it up. That way I can do most of my initial engine break-in on a new rebuilt engine before I make final adjustments to the carb. There is another basic difference in the IDLE MIXTURE adjustment. On an automobile carb we always adjusted IDLE MIXTURE screws for the midpoint between too rich and too lean. That does not work for the Ford 8N Tractor because this carb does not have an accelerator pump. The correct IDLE MIXTURE adjustment for these tractors is closer to the edge of being too rich. If you tune this tractor carb like your old car, it will act very fussy every time the throttle is opened. Adjusting to the rich side helps, but it is normal for these engines to hesitate if the throttle is opened too quickly. So, once you have your engine warmed up, and running well on the main mixture, move the throttle lever is all the way to the idle position and start backing-off the IDLE SPEED screw until you get in the neighborhood of 450-500 RPM, then try adjusting the IDLE MIXTURE screw. The correct procedure is to simply turn the IDLE MIXTURE screw in until the engine stumbles (too rich) then back out until the engine runs good. When you do that the idle will usually be a little higher. Turn the IDLE SPEED screw out a bit more, then readjust the IDLE MIXTURE screw again. Do that about 3 or 4 times to get the tractor worked down to a slow idle between 450 and 500 RPM. Some engines will go all the way down to 400 RPM, but I feel that makes them too easy to stall. Properly tuned, the engine should accelerate smoothly, without smoke, as you advance the throttle lever from idle to full throttle. Please keep in mind that you are not working on a race car. Instant responsivness to sudden throttle movement is not normal operation. You just want smooth acceleration and deceleration when the throttle setting is changed. For most chores you can pretty much ignore the MAIN MIXTURE adjustment and leave it at 1 to 1-1/2 turns out from the bottom (3 turns for Zenith). The directions in the manual for adjusting the MAIN MIXTURE screw are a bit awkward. Sounds simple at first. It is almost exactly the same as for the idle mixture screw, "Turn the adjustment screw in until the engine just begins to lose power, then turn the screw out until the power picks up and the engine runs smoothly." Simple, Right? The only problem is they want you to do this with the engine running at governed speed under full load. I have not figured out how to crawl up on the hood to adjust the throttle while pulling a plow in second gear. "Ok son, hang on up there while I git her moving and try not to fall off while you turn that thar screw." If you cannot get any adjustability out of the idle mixture screw, then you probably have a blocked idle passage or vacuum leak that is throwing everything off. It may be time for a carb rebuild. If my engine hesitates or backfires under load (too lean), I just stop and get off, turn the MAIN MIXTURE screw out about 1/8 of a turn, get back on, and try it for a while. You should not need to open the MAIN MIXTURE screw past a total of 1-3/4 turns out from the bottom (The Zenith may need a little more). Remember the adjustment for the IDLE MIXTURE screw and the MAIN MIXTURE screws are different. The MAIN MIXTURE screw is the more normal, in for LEAN, out for RICH. Occasionally you may notice a fully warmed up engine that won't run right or seems to run a little better when you hold the choke knob out a bit. Don't immediately start adjusting your carb. This is more often a sign that you need to clean and adjust your points. Do that first. If the problem goes away, great. If the problem still exists, try going 1/2 turn out on the main mixture screw. If that fixes it but the problem comes back in a few days, I suspect you have a rusty tank and the fuel filters or fuel line are getting clogged up. If your carb needs rebuilding, no reason you cannot do it yourself. Rebuild kits are inexpensive, around $30. The instructions with the kits are sadly lacking, so I've attempted to fill in some of the blank space with a carb rebuilding page HERE.